With Mother’s Day being right around the corner I was trying to come up with a cute idea for our daughters’ gifts this year. And I did! But I can’t tell you because it’s a secret…..sssshhhhhhhh! Cause they might read this ! But while I was browsing and researching I found some other darling inspirations and thought I would share. I’m sure before May gets here I’ll have a list of a dozen or more. I’ll keep you posted. These 3 charming DIY projects are from the Lowe’s creative ideas website. 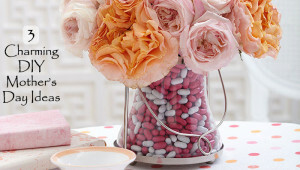 The inside is a vase for flowers while the outside is a vessel for candies. So cute! You could also accomplish basically the same affect by placing a smaller glass cylinder into a larger cylinder. Small curved satin nickel lantern or any lantern you may have or run on to. Insert a jar, vase, or drinking glass in the center of the lantern. Its rim should be about even with the rim of the lantern. Fill the lantern with small, loose candy — the more colorful the better. Fill the glass in the center about half-full of water and add flowers. Valspar spray paint: Frosting, Frosty Berry, Everglade Glen (Valspar is the Lowe’s brand name. It’s really good paint). Choose a stencil. Cut the stencil out and stick it on the jar. 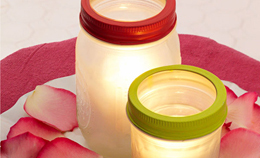 Apply three light coats of Valspar Frosting spray paint to the jar. Let it dry and then remove the stencil. Remove the center of the lid and spray-paint the rim with a paint of your choice. Add a candle and voila! Depending on the stencil you choose these candles can be made for any holiday. I have one with Autumn leaves stencils and a brown satin ribbon tied around the lip of the bottle. It’s darling with some fall foliage. If you purchase your materials at Lowe’s or Home Depot they will cut the plywood and acrylic to the size you want. I think they do up to 10 cuts for free. Good deal!! Cut the plywood and acrylic sheet into 2′ x 2′ squares. Stack two squares of acrylic on one square of plywood and clamp together. Measure 1-1/4″ from each corner and slowly drill a 5/16″ hole through the acrylic and plywood. TIP: If you have a drill press, using a clamp-on fence and a stop block will make this quick and easy. Sand the plywood faces and edges with 100-grit sandpaper. Wipe off dust with a cloth. Cut a 10″ long piece from the whitewood board to use as center support. This will keep the acrylic squares from sagging in the center of the frame. Glue the end of the support to the middle of the plywood’s front side. (The artwork will hide the support.) Weigh down the support while the glue dries to ensure a good bond. Mount a large D-ring hanger to the back of the plywood with a screw. 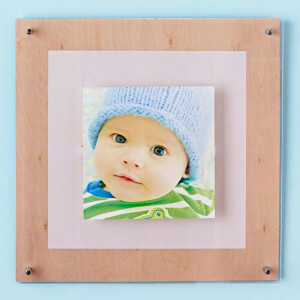 Center and tape your photo or artwork to one acrylic square. Top with the second acrylic square. Then connect the acrylic and plywood pieces using the hex-head bolts, steel spacers, and lock nuts.